To learn how to participate in Birds In My Backyard, click here. Today, most of the faced environmental problems are the result of lack of environmental education. It is very important to start environmental education in the school period, with this appropriate attitude will be developed at an early age. However, as we know, children like to play, but not to learn. Accordingly, the education should be designed as a game, and not like a lesson. For such type of interactive education, the watching of the birds is of high advantage such as competition, joy and safe and a way of close interaction with nature. In winter, as many birds come to the cities, towns and villages with the hope to find some food, it is easy to close distance for watching them by attracting their attention with food. Bird feeders are preferable to be made by children because of two purposes: education of children and feeding of the birds, and participation and help of the parents in the process. It will be also an indirect support to develop positive attitude to birds, which is very important and actual nowadays in panic conditions concerning to threat of avian influenza. 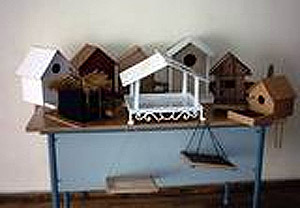 To take part in the competition, you must present either a picture of a feeder, a picture of a bird near the feeder or a story on making observations of birds near the feeder, no later than March 15, 2010. To learn how to present photographs, as well as observations and pictures, click here for more specific information. Each participant may take part in all the three competitions at the same time. The authors of the best works will get a wonderful illustrated book A field guide to birds of Armenia in Armenian language. The best observations, pictures and photographs will be placed on the Acopian's Center's Birds In My Backyard website for all the world to see.